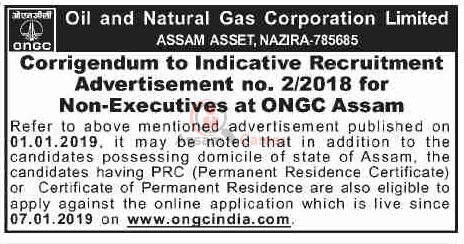 Oil and Natural Gas Corporation Limited, ASSAM ASSET, NAZIRA-785685 has issued a notice regarding domicile certificate for the recruitment of Non-Executives [Class-III & Class-IV posts ] at ONGC Assam against Recruitment Advertisement no. 2/2018 . According to this, it may be noted that in addition to the candidates possessing domicile of state of Assam, the candidates having PRC (Permanent Residence Certificate) or Certificate of Permanent Residence are also eligible to apply against the online application which is live since 07.01.2019 on www.ongcindla.com.